An analysis by Fairness & Accuracy in Reporting (FAIR) has found that the purportedly liberal cable network MSNBC did not run a single segment devoted specifically to the humanitarian catastrophe in Yemen in the second half of 2017, even though – or perhaps because – the U.S. government has played a key role in creating the catastrophe. During this period MSNBC ran nearly 5,000 percent more segments that mentioned Russia than segments that mentioned Yemen. In all of 2017, MSNBC only aired one broadcast on the U.S.-assisted Saudi airstrikes that have killed thousands of Yemeni civilians. And it never mentioned Yemen’s cholera epidemic, which infected more than 1 million Yemenis in the largest outbreak in recorded history, a direct result of the U.S.-assisted Saudi/UAE war and blockade. 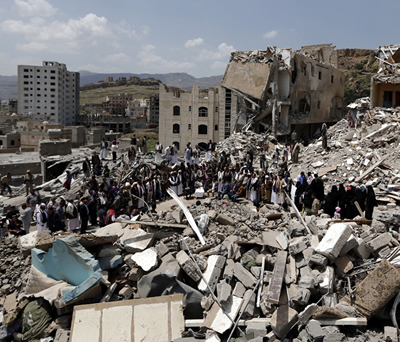 The Pentagon has been refueling Saudi and UAE warplanes bombing purported Houthi targets in Yemen, even though Congress has never authorized such military action in Yemen, as required by the Constitution and the War Powers Resolution. Section 8c of the War Powers Resolution defines U.S. participation in hostilities as including participation in the movement of foreign forces on their way to combat; clearly, refueling Saudi/UAE warplanes during their bomb runs meets this definition. The Pentagon has been able to get away with this unconstitutional military action, in significant measure, because major U.S. media have refused to consistently report on the humanitarian catastrophe in Yemen and especially because they have rarely reported on the direct U.S. military role in causing the humanitarian catastrophe. MSNBC: Stop censoring the U.S.-assisted carnage in Yemen.